The first scooter was noticed two weeks ago. Then a poster saying that walking over the ice is dangerous and prohibited replaced “don’t smoke drunk in bed” on the city’s main square by the T-34 tank on a pedestal. A few days ago I saw the first mosquito by the spring that supplies drinking water to us miserable wretches who get only sulphur-smelling stuff from the tap. And yesterday it was the true sign of spring – the first babushka by the apartment block entrance, an iconic small-town image during the warm season. 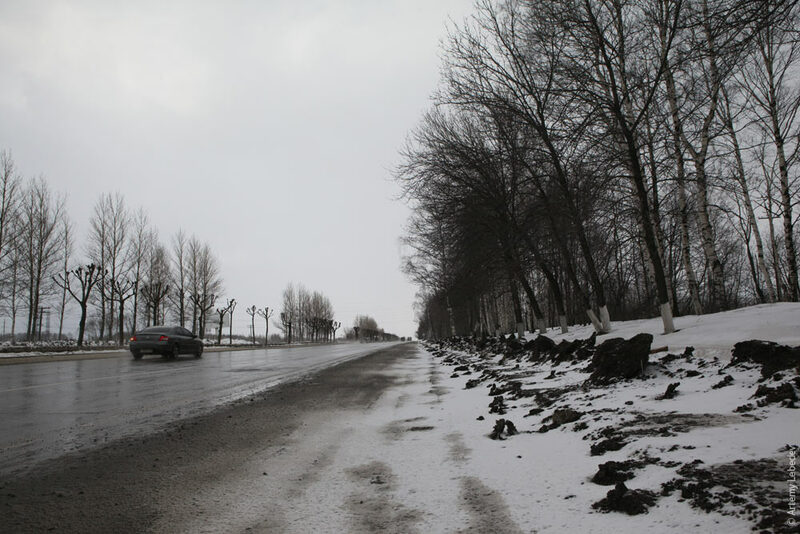 First-time visitors to Russia often express surprise at the amount of mud, slush or dust, depending on the time of the year, on roads here. This article from tema.livejournal.com, that I’m even tempted to translate into English although pictures make the story almost obvious, explains why it happens here but not in other countries with similar climate. Highly recommended whether you seek to satisfy curiosity or are on a search for the cultural code. That’s why I’m placing this recommendation for the mud story to the Background reading category. Murmansk, -20C (-4F). The poin is to commemorate the baptism of Jesus in the River Jordan, thus the icehole in the shape of a cross, or marked by a cross. The practice seems to be frowned at by the church but its popularity is on the rise. This year the authorities banned ice bathing in Kandalaksha because, it was said, one foot of ice wasn’t enough to make it safe. In Moscow on the other hand they cut holes all over and even installed a huge barrel in the middle of the Red Square. Karelia, Petrozavodsk, Onegskoe Lake. +2C, rain. Photo by Igor Podgorny. Some time ago Pasha has come up with the “Winter is the Soul of Russia” concept. As always, he was late. I’ve been dragged onto ice a lot recently (and also to cemeteries, where drowning was often indicated as the cause of death). And hearing stories, in vivid details. And shown crosses, erected if you **didn’t** drown despite all odds, on top of many local hills and along the cost. Also, as I’m researching the travel market here it becomes even more apparent that salmon is the top thing that brings you guys here, and a lot of it is done while ice is still on. All that compelled me to post these three videos with instructions on how to proceed should you find yourself in water. The car and camper got an all around pre-winter check. Yesterday I filled all four cans with propane, and am testing the outfit for winter worthiness thoroughly over the weekend.